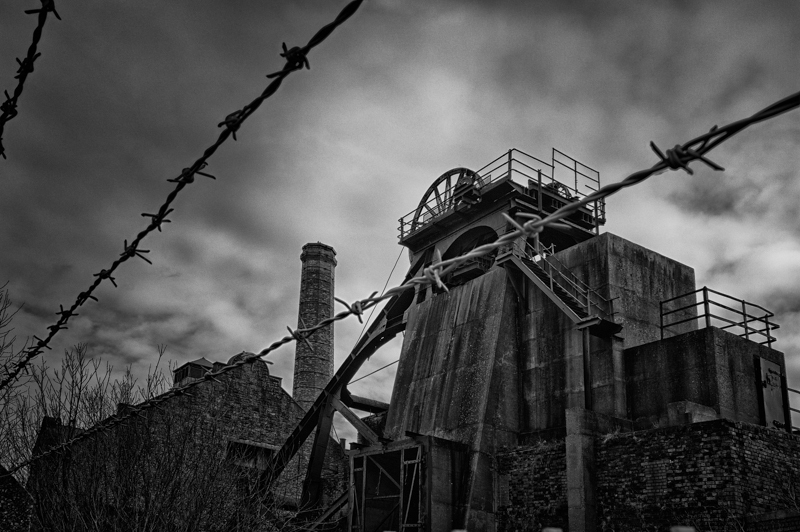 Pleasley Colliery is the only preserved coal mine in Nottinghamshire, and is worth a visit if you are in the area. I don’t think I’ve posted this before and it’s probably the best one I took on my visit. Unfortunately the sun was behind the mine when I was there, which made photographing it from the best vantage points difficult, but I’ve managed to recover something from this one. I composed it with the barbed wire prominent in the scene, as being a child of the 80’s, I have vivid memories of the strife and conflict that was the miners strike, even though the coal mines were long gone in the area I grew up in. I remember seeing a photo taken in the 70’s of the courthouse in Belfast, and it was taken through barbed wire, almost like the place was under siege. Pleasley is quiet now, as is the British mining industry, but the barbed wire and headgear are both powerful symbols, especially when in the same frame.